Have you read all 4 Mox' books? Available at Amazon! 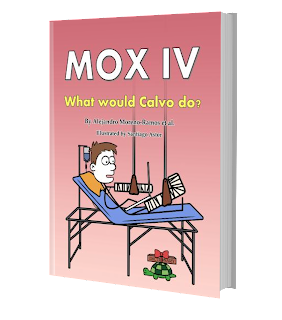 2 Mox IV - What would Calvo do? THE present for translators for just €19.95. This fourth volume of the best-selling series Mox features well-known Calvo becoming the richest translator on earth, Mox committing a crime and spending some time in prison, where he will learn valuable lessons. In the meantime, his wife Lena is not sure that freelance translators are human and will do some research. Meanwhile, readers will learn some practical lessons on the best way to flirt with a translator and about livening up translator parties. This book is a must to understand the translator’s universe. Mox IV features more than 200 black and white comic strips, more than half of which have never been published before, as well as articles written by some of the best-known names in the industry.